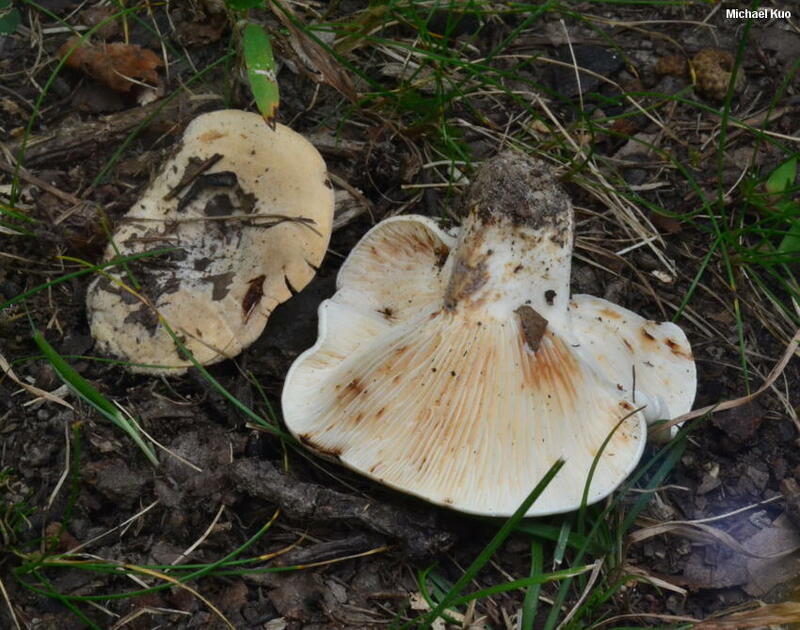 Like a whitish to yellowish version of Lactarius volemus, Lactarius luteolus has copious white milk that stains everything brown and smells like fish. In fact, the fish odor appears to get worse as time goes by; I have just studied several specimens collected years ago, and my lab reeks just from opening them up for a while. Though they are not needed for positive identification, other distinguishing features for Lactarius luteolus include its dry, almost velvety cap surface and, under the microscope, its small spores with isolated warts and the interesting capitate terminal cells in its pileipellis. Ecology: Mycorrhizal with oaks and possibly with other hardwoods; growing alone, scattered, or gregariously; summer through fall, or over winter in warmer climates; widely distributed east of the Rocky Mountains. The illustrated and described collections are from Illinois. Cap: 3-6.5 cm; convex at first, becoming more or less flat, or shallowly depressed; dry; very finely velvety; dirty yellowish white to yellowish or, with age, somewhat brownish; not zoned; the margin not lined. 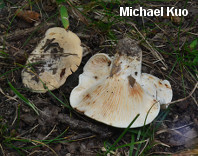 Gills: Broadly attached to the stem or beginning to run down it; close; short-gills frequent; white; staining slowly dark brown from the milk. 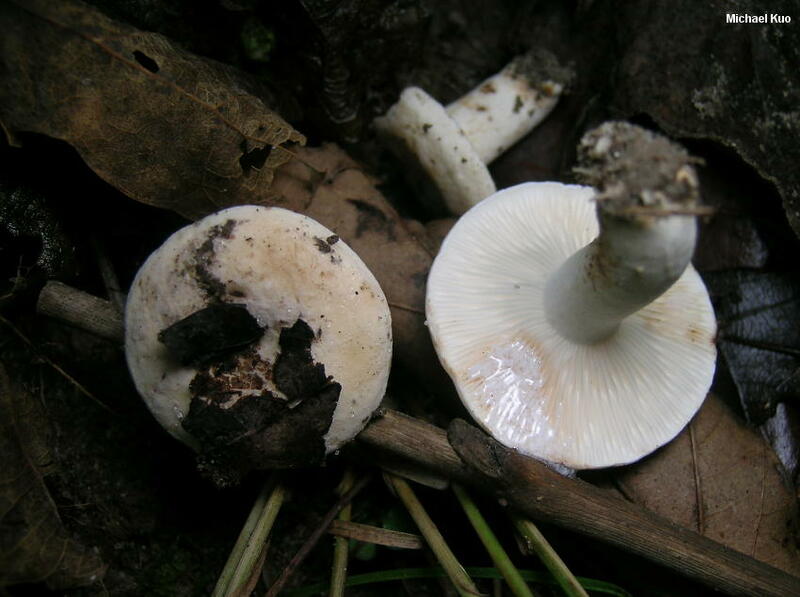 Stem: 2-3 cm long; up to 1.5 cm thick; slightly tapered to the base; without potholes; colored and textured like the cap; staining slowly brown from the milk. Flesh: White; staining slowly brown when sliced. Milk: White; copious; staining tissues slowly dark brown; staining white paper dark brown. 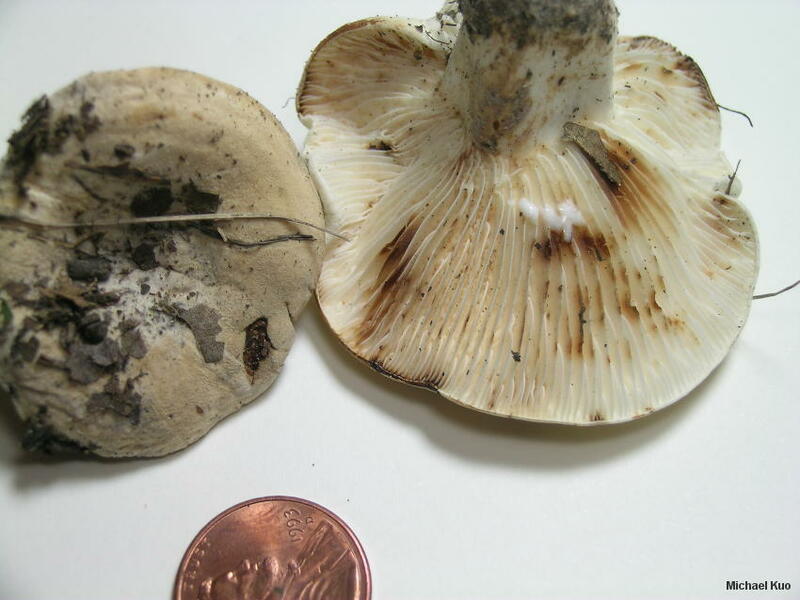 Odor and Taste: Odor strong and fishy (like that of Lactarius volemus); taste mild, not distinctive. Chemical Reactions: KOH on cap surface slowly pale orange. 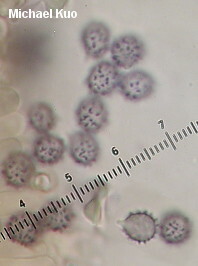 Microscopic Features: Spores 6-8 x 4-5 µ; ellipsoid or, infrequently, subglobose; ornamented with isolated amyloid spines extending about 0.5 µ high; connectors rare and scattered. 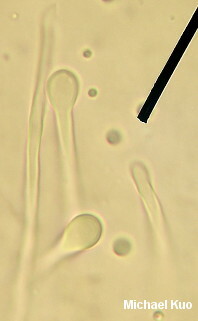 Cheilocystidia cylindric to filamentous. Pleuromacrocystidia scattered; inconspicuous; cylindric to lageniform; barely projecting. Pileipellis a lamprotrichoderm; elements 2-4 µ wide, thick-walled, hyaline with ochraceous walls; terminal cells mostly capitate to subcapitate, but occasionally clavate or merely cylindric. REFERENCES: Peck, 1896. (Saccardo, 1899; Kauffman, 1918; Smith, Smith & Weber, 1979; Hesler & Smith, 1979; Weber & Smith, 1985; Phillips, 1991/2005; Lincoff, 1992; Roody, Herb. Kuo 07081103, 08291405.